The Cardinals bullpen settled down from its challenges the past two games — Octavio Dotel, Marc Rzepczynski and Jason Motte retired all six batters they faced in the eighth and ninth. All of which brings us to that bottom of the ninth. 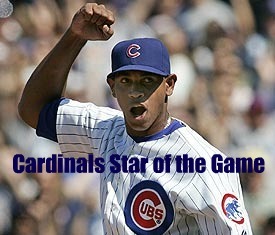 Cubs closer Carlos Marmol was looking for his 35th save in 43 chances. (Blown saves? Really?) Adron Chambers was cheering from the dugout, encouraging the crowd to join him, as Lance Berkman stepped to the plate. He was retired quickly on a fly to Marlon Byrd in center. Next was Matt Holliday, returning to the lineup yesterday for the first time since Sept. 13 and hitless for the afternoon. He changed that by singling to right-center, with Tyler Greene taking over as a pinch-runner. On a 2-1 count, he took off for second — with Geovany Soto’s throw to second bouncing off Darwin Barney’s glove and allowing TPG to end up at third. The crowd was giddy with the tying run now 90-feet away … and then Freese struck out. Yadi came to the plate. After the count ran full, he walked. Mr. Cheerleader Chambers was on to pinch-run. Skip Schumaker was next, soon the count was full — and it was another walk for Marmol. Corey Patterson, who had taken over in center field in the top of the inning, was called back for another former Cub — Ryan Theriot. Could he be the game-winning hero for the second time in five days? He showed tremendous patience in his at-bat and, with a full count, also walked. Tie game! So up came Rafael Furcal. First pitch, called strike one. And the second pitch was way inside, almost hit Furcal in the knee and skipped past Soto all the way back to the track. Chambers raced home from third — and that was a winner! Manager Tony La Russa said he got accidentally punched in the jaw during the ensuing celebration. He said it was sore, but didn’t seem to mind. Of course everyone at Busch Stadium and at home knew what was happening in Washington, D.C., during the Braves-Nationals game at the same time. And shortly after the Cards game ended, the Nats took care of business and finished off a 4-1 victory. Tomorrow is the final home game of the season. Is it also Albert’s last game as a Cardinal at Busch Stadium? Joe Strauss of the Post-Dispatch has more on that possibility. This entry was posted in 2011 Season and tagged 2011, Five years ago today ..., Walk-off winners by Christine Coleman. Bookmark the permalink.